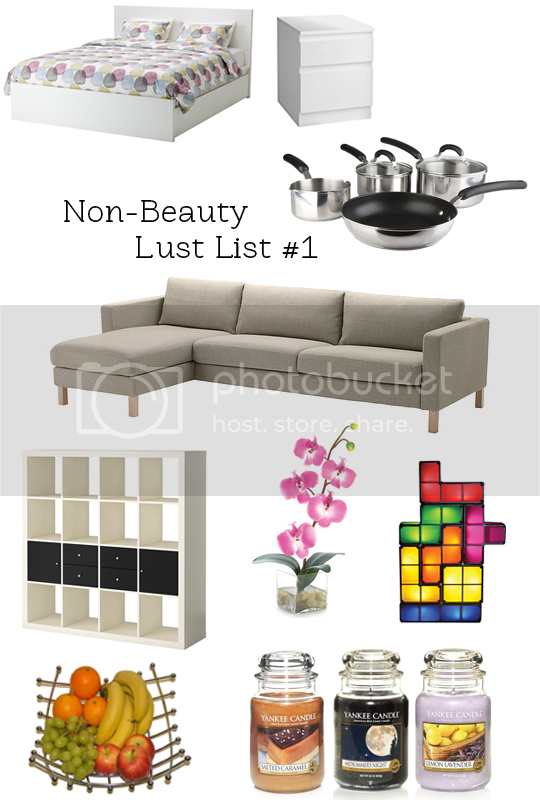 Something a little different today, a non-beauty lust list. At the weekend, Colin and I signed on the dotted line for something we’ve been thinking about for a while; in the New Year, we’ll be moving into a new flat – in the Olympic Village! Now, unfortunately there is a teensy little fly in the ointment in that our new place is completely unfurnished. We have a lot of our own furniture, but the flat we currently live in is furnished – which means we will be without a bed or sofa for the first few weeks until our next payday. With that in mind, I’ve been having a little search for some necessities that won’t break the bank but won’t be cheap and rubbish enough to require a replacement a few months down the line – and throwing a few pretty things onto my wishlist as well, just because. First thing’s first, number one on the priority list – a bed. We’re going to be alright for a mattress as my nan’s got an almost-brand-new one to donate to us. Living in a flat and having a lot of stuff means capitalising on storage is paramount, so I’ve got my eye on this particular bed frame from Ikea because of its hidden storage underneath. It also comes in a dark grey shade, but the flat’s not huge so lighter coloured furniture will help it feel a bit less enclosed. Next up, bedside tables. I actually have one already from when I lived at mum and dad’s which we’re using now. We currently have the bed pushed against a wall so we only need one table, but my thinking is to use that in the spare room and get two new ones for our new bedroom as we don’t intend to have the bed against a wall. These ones are from Argos. White, to match the bedframe, and again drawers are important! Pants, bras and socks go in the top drawer and pajamas go in the bottom one. That’s just how I operate. Now, something for the kitchen. The new flat has an induction hob, which is great when it comes to the energy bills. It’s not so great when you consider I’ve spent a fair chunk of cash building up a sizeable collection of cookware since we moved into this flat, and now 99% won’t be compatible with the new cooker! Bloody nora. It’s going to cost me a small fortune to replace absolutely everything, but I’ll probably start with this Prestige set from Lakeland as it’s half price at the moment. To the living area – a sofa is required! Again, something in a light neutral colour. We actually have two sofas in our current place so we’re used to having one each to spread out on. I don’t think we’re going to have the space to do that now, so a chaise sofa seems like a good compromise (and they look pretty cool too). This one is from Ikea – can you tell I’m trying to do this on the cheap yet?! More storage. The bookshelf type thing is another find from a certain Swedish flat-pack furniture giant (no prizes for guessing which one). Placed against a wall, this won’t take up too much space but will give tons of room to store miscellaneous bits and pieces – magazines, books, DVDs, games and the like. For any that wouldn’t look particularly ordered in there, I plan to pick up some nice fabric-covered boxes or something. Just need to find some that will fit perfectly in the squares! Now for less essential things – orchids are my favourite but they’re not a cheap flower, so some artificial ones would be ideal. And they’ll go nicely with the bonsai tree we’ve been cultivating all year! I’ve seen this Tetris inspired light on a number of online stores, and have always thought it’s really cool. You can take the pieces apart and stack them however you like! Something cool for the coffee table, maybe. When we moved into this flat, there was a super cool fruit basket that has been invaluable due to my excessive consumption of fruit. It’s not listed on the flat’s inventory so I hoped I might get away with pinching it, but on closer inspection you can see it in photos of the kitchen so I thought I’d better not! Luckily I’ve found exactly the same one on eBay for about a fiver. Last but not least, what’s a new home without some lovely fragrance? Yankee candles are my favourite – I do love Diptyque but they’re so pricey. I’ve burned through a few Midsummer’s Night candles before, that’s probably my favourite scent, but I also like the sound of Salted Caramel (mmm) and Lemon Lavender. Have you tried checking local Asian grocery markets for Orchids? Every one I’ve ever been to (granted, I live in the states) always has such a beautiful selection of orchids and bamboo planters for way cheaper than anywhere else, and they are so healthy and lovely despite being in a cold store. It might be worth a check. Ikea actually do a lot of storage boxes that fit that shelving unit, they are really nice too!